BEIRUT: Regime forces upped the pressure on two of the last rebel bastions in Syria, with air strikes in Idlib province and a move to break a siege near Damascus Monday. Syrian and Russian aircraft pounded targets in the northwestern region of Idlib, pressing a week-old operation targeting the last province in the country to escape government control. Air strikes by regime and Russian aircraft on rebel positions in the northwestern province of Idlib killed at least 21 civilians, including eight children, a monitor said Monday. Raids Sunday left “at least 21 dead, including eight children and 11 members of the same family” west of the town of Sinjar in the southeast of the province, the Syrian Observatory for Human Rights said. “Regime and Russian strikes are continuing today on several parts of Idlib” province, Rami Abdel Rahman, the head of the Britain-based monitoring organisation, told AFP. Russian-backed regime forces launched an operation on the edge of Idlib province in the last days of 2017 and have retaken villages every day since. After the collapse of the Islamic State group in both Syria and Iraq late last year, President Bashar al-Assad’s regime is bent on restoring its grip over the country. Idlib province, which borders Turkey, is almost entirely controlled by anti-government forces that are dominated by a jihadist outfit known as Hayat Tahrir al-Sham (HTS) consisting mostly of fighters from a former Al-Qaeda affiliate. Among the other groups present in the province are thousands of jihadists from Central Asian states and members of the Muslim Uighur ethnic minority of China’s Xinjiang province. An explosion on Sunday in the city of Idlib at a base for the group Ajnad al-Qawqaz, made up of fighters from the Caucasus that operates alongside HTS, left at least 34 dead, including 19 civilians, the Observatory said. The initial death toll for the attack, the origins of which remain unclear, was 23 but the number went up on Monday when more bodies were found in the wreckage. 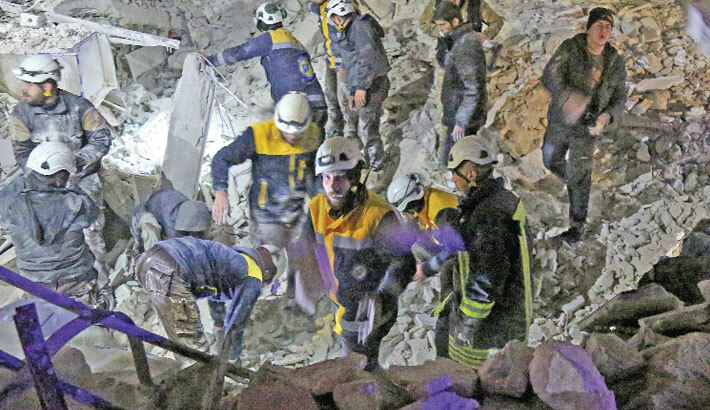 Abdel Rahman said the casualty count could yet rise because more victims were believed to be buried under the rubble and many of the wounded were in critical condition. “Rescue teams are still sifting through the wreckage,” he said. It was not immediately clear whether the blast was caused by air strikes or was the result of the kind of internal clashes that sometimes break out between jihadist and rebel factions. After shrinking to barely a sixth of the country at the height of the nearly seven-year-old conflict, the areas under government control now cover more than 50 percent of Syrian territory.